A new generation of extendable dining tables. FONTANA combines the uniqueness of natural stone with the experience of an innovative synchronous mechanism. Unfold the table to a banquet – effortless and apparently magical. DRAENERT typical - the expressive, trapezoidal table top adds the finishing touch. The FONTANA has received four awards! 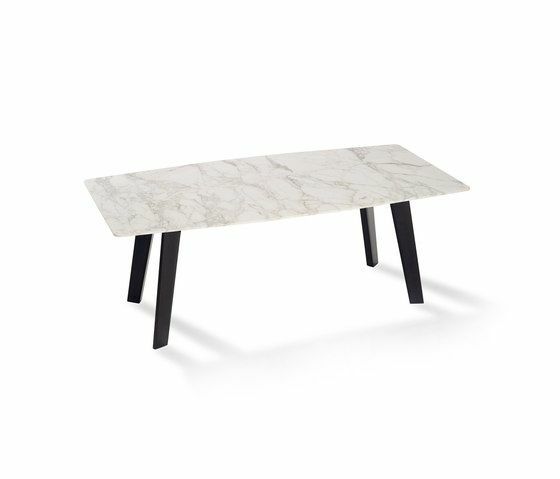 Table Top (trapezoidal): Natural Stone Calacatta Gold, Marble from Italy, surface leathered. Base: Side Walls or 4-legged, oak stained to swamp-oak-look. Table Top trapezoidal rounded: 105 x 180 cm, height 74 cm, extended: 260 cm 105 x 200 cm, height 74 cm, extended: 280 cm About 180 different natural stone types from all over the world are available. Legs and side walls are available in oak with various stains. DRAENERT is a top-brand of the international furniture design for forty five years.